Here is the list of Best Free HTML to PDF converter software for Windows. These software come in handy when you want to convert an HTML to PDF or a webpage to PDF. Using these software, you can also batch convert HTML to PDF. In the following list, you will find software that convert HTML files stored locally on PC, software that convert webpages by entering their URL, and software that can do both. Command line HTML to PDF converter have been also included for people who like to work on command prompt. One of the mentioned command line software can convert webpage to PDF as well. In the following list, you will find software, command line tools, and browser extensions that let you convert HTML and webpage to PDF. Go through the list to know how these software can be helpful to you. You will also get to know how to convert HTML to PDF using these freeware. I like Winnovative Free HTML to PDF Converter and Weeny Free HTML to PDF Converter the most. Winnovative Free HTML to PDF Converter lets you convert both local HTML and webpages with various advanced options. Along with custom page layout, you get options to include JS, Embedded fonts, links, etc. to the converted PDF. Weeny Free HTML to PDF Converter is a very simple tool and the best part about it is its capability to batch convert HTML to PDF. You can also enter URL of a webpage to convert it to PDF. You can also checkout the list of best free PDF to HTML Converter, Software To Extract Images From PDF, and Batch PDF Splitter Software. Winnovative Free HTML to PDF Converter lets you convert HTML to PDF with advanced options to set output PDF layout and more. You can also use it to convert HTML to image. The best thing about this software is that it lets you convert local HTML files from your PC as well as websites through URL. But, you can only convert a single file at a time. After you start HTML to PDF conversion, the output will be displayed in your PC’s default PDF viewer. A copy of the output PDF will be saved in the folder where the exe file of this software is located. I would recommend this software if you are looking for custom HTML to PDF conversion options. Weeny Free HTML TO PDF Converter is a free HTML to PDF converter and also lets you convert website to PDF. This is one of the best software that you can use for HTML conversion. You can add a HTML file, or simply enter the URL of webpage you want converted. With this freeware, you can even batch convert HTML to PDF for free. Multiple HTML files and URLs can be added to the list for conversion simultaneously. After you have added all the files for conversion, you will have to select the output folder and then begin Conversion. All the files are saved in separate PDF files. The pages in PDF are arranged in A4 size pages. In the converted file, hyperlinks and images are retained. Although HTML to PDF conversion takes a good amount of time, the results are satisfactory. Pisa is a free command line HTML to PDF converter software. It lets you convert HTML to PDF with CSS file to maintain styling in the output PDF file. You can also use various operators to view debugging info, view encoding, open converted file in default PDF viewer, show warnings, and much more. pisa.exe "<HTML file location\filename>" "<output location>"
pisa.exe "C:\Users\ILFS\Desktop\HTML\LIST OF FREEWARE (3).html" "D:\listoffreeware"
As I mentioned, there are various operators that you can use with the command for desired PDF conversion. To view the whole menu of operators that you can use, simply type pisa.exe and press enter. wkhtmltopdf is a command line webpage to PDF converter software. Using this command tool, you can convert webpage to PDF directly from URL or by HTML files stored on PC. You can use it to convert various types of webpages to PDF, such as: single webpage, cover webpage, or table of content. You can define the webpage type along with the command, so that it prints PDF according to the defined layout. Just like Pisa, you will find a lot of operators which you can use to get desired output. Some of the options these operators provide are: print multiple copies in PDF file, generate PDF in greyscale, render low quality images in PDF, set page orientation to Portrait/Landscape, set page size, etc. The converted document will be saved in the designated folder. After the conversion, warnings and errors are displayed on the screen. To access the list of operator to use, simply type wkhtmltopdf.exe in CMD and press enter. This tool makes webpage to PDF conversion a whole lot easier and you must give it a try if you like working on command prompt. HTML To PDF is a free HTML to PDF converter with HTML editor. You can only convert a single HTML at a time. When an HTML is loaded, its codes show up on the interface. In case, you want to make any changes to the HTML codes, you can do that. You can even Debug the loaded HTML after editing to make sure its error free. An option lets you preview the loaded HTML before conversion. Begin conversion once everything is set. The converted file is saved as a single PDF with its contents aligned on A4 size pages. The images and hyperlinks are retained. Its a good option for someone who wants to make changes to HTML before converting it to PDF. Under PDF Settings tab, you get options to encrypt PDF, embed fonts, and even attach documents to PDF. You will have to select a folder to save the output files before conversion. You can also choose to merge all the documents into one PDF file. Script warnings and errors are displayed on the interface during conversion. Prince is a very advanced and well known tool to convert webpage to PDF. LibreOffice is another good option that you can consider to convert HTML to PDF. When you open an HTML file in LibreOffice, it opens up in LibreOffice Writer/Web. The file loads as webpage on its interface. To convert HTML to PDF in LibreOffice Writer/Web, simply go to File menu and click on Export option, then select PDF as output format. There are several output parameters that you can set before conversion. You can select a page range or make a selection on webpage for conversion. Set image compression parameters, add sign with watermark, choose to export bookmarks/placeholders/comments, set page layout options, add digital signature, etc. After conversion, a dialogue box displays warnings and errors if encountered while conversion. iWeb2x – URL to PDF & Image is a free Chrome extension to convert webpage to PDF. Unlike other browser extensions, this extension comes with some customization options. As soon as you install it, its icon will appear on Chrome. Open the URL you want converted in Chrome and click on iWeb2x icon. A small dialog box will pop out where you can select if you want to save the webpage as PDF or Image. Under the PDF option, you can select Page size (letter/legal/folio/tabloid/A0/A1/A2/A3/etc.) and Page orientation (Portrait/Landscape). You can also choose if you want the PDF to be rendered Gray Scale, with no images, or without background. As soon as you click on Save as PDF, a download link appears. Click on it to download the PDF to your PC. If you load a locally saved HTML to Chrome and try to save it as PDF, you will not be able to. 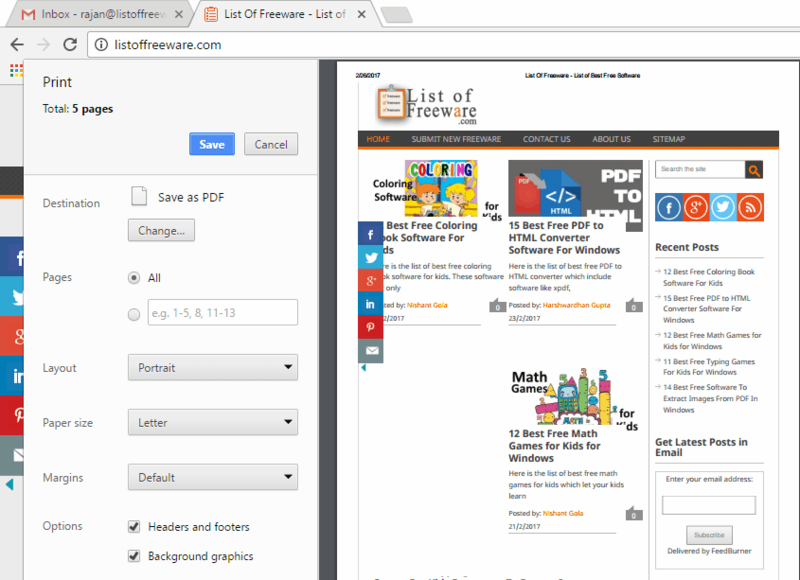 Save as PDF is another free Google chrome extension to convert webpage to PDF. It is also available as an add-on for Firefox, which you can get here. It is a very simple tool, and does not comes with any advanced feature. Download and install the extension from the link given below. Once installed, a small icon will appear on the Chrome interface. Now, all you have to do is load the webpage you want to convert to PDF and click on this extension’s icon. A copy of PDF will be automatically downloaded to Chrome. Sadly it does not supports conversion of local HTML files. This tool to convert webpage to PDF works the same for Firefox. There is a Pro version of this extension, which lets you set output PDF layout according to your choice. There are various other configurable options available in the Pro version, but to use it, you will have to pay for it. 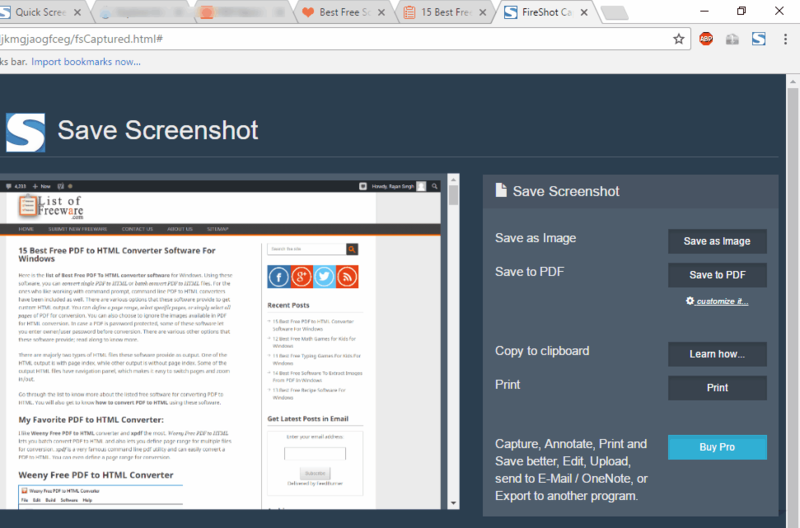 FireShot Capture is a Chrome extension that creates PDF of webpages by capturing their screenshot. It actually scans the webpage that is open in the browser, captures it as an image, then turns the image into PDF. Using this software, you can even convert HTML files locally saved on your PC; you just need to open the HTML in Chrome. There are 3 types of webpage capture modes available: Capture entire page, Capture visible part, and Capture selection. Begin with opening the webpage that you want to convert to PDF. Click on the small icon that appears on Chrome after installing this extension. You will view 3 options to capture webpage. There are even Hotkeys defined for these modes. When you select a mode, this extension begins scanning the webpage, then renders it as a PDF file. FireShot Capture is not a good choice if you want to preserve hyperlinks and images separately on your PDF. Also, the text will not be selectable, as it will be saved as image. PDF Creator is a very simple webpage to PDF converter add-on for Firefox browser. All it takes is a single click on this add-on’s icon, and it converts the open webpage into PDF. You will not find other advanced options here, but it does its job pretty well. After you install this add-on, you will view its icon appear on Firefox’s interface. Simply load the webpage you want to be converted and click on the icon. The converted PDF opens in a separate tab, which you can download to your PC. WebToPDF, as the name suggests, is a webpage to PDF converter. It is a free add-on for Firefox. This tool works exactly the same as above mentioned add-on, PDF Creator. Open a webpage and click on the icon to convert it to PDF. There are some additional options available with this add-on, which you will be able to view once you click the arrow besides this add-on’s icon. These options let you open PDF in new tab, save webpage as Image, save Text to PDF, email selected text, and view page source. The output PDF is saved in A4 pages and retains hyperlinks and images. Doxillion Document Converter from NCH software lets you convert HTML to PDF for free. Using this software, you can also batch convert HTML to PDF. Do remember that the free version is only available for non-commercial purposes. Once you have added all the HTML files to convert, select the output format as PDF, and select an output folder. Document setting lets you adjust layout margins in inches or centimeters. This software does not works perfectly with modern webpages. During testing, it converted only basic HTML files perfectly. While converting one of the pages of our website, it rendered the images but text was missing from PDF. Doxillion can be used for various document conversions for the following formats: DOC, ODT, PDF, RTF, TXT, XML, Images, PHP, etc. Icecream PDF Converter is a free PDF converter software, that can convert HTML to PDF files. Using this software, you can batch convert HTML to PDF. But, the free version has some limitations. You can only convert 5 files at a time and a maximum of 10 pages per file. When you add HTML files here for conversion, for each file, you can set filename, title, publisher info, and password. You can even choose to merge all HTML to a single PDF. Under the settings menu, you can set output image quality and output folder to store converted files. Begin the conversion once everything is set. In the output PDF files, the contents of website are arranged on multiple A4 sized pages. Apart from HTML to PDF conversion, you can carry out various other PDF related conversions. You can either convert PDF to various other formats, or convert various documents to PDF. These formats include: jpg, png, bmp, tiff, doc, docx, xls, odt, epub, etc. PDF Printers are good way to convert HTML to PDF directly from browsers. If you use any other browser other than Chrome, then you will need a PDF Printer to convert webpage to PDF directly from browser. The process to do this is almost same as in Chrome. Open a HTML/webpage then Print it. You will need to install a PDF Printer beforehand. If a PDF Printer is installed, it will appear in the list of printers. Select the PDF printer to save the converted PDF on your PC. You can choose a good PDF Printer for your PC from here.